Nothing is more fitting for a chilly October night than classic tales of werewolves, vampires, mad doctors and fatal freak disasters all alongside graphic illustration to emphasize the horror. These are the elements that make the creepy collection of “nauseating narratives” in “Tales from the Crypt” complete. “Tales from the Crypt” is a classic comic book series originally published under Entertaining Comics group in the 1940s. The series lasted 15 years until the Comics Code Authority banned all publications from containing violence and horror. This didn’t stop terror-enthusiasts from continuing to read and collect the “spine-tingling” tales. The comics were also made into a popular television program of the same name in the 1990s that ran for 93 episodes. Today, you can find the original stories with digitally re-colored illustrations under Dark Horse Comics. “Tales from the Crypt Vol. 4” combines issues 35-40 to include a total of over 30 haunting accounts. A “host in howls” presents each and every tale whether it is the famous Crypt Keeper, the Old Witch, or the Vault Keeper. An introduction is given to all the “boils and ghouls” before the “blood-curdling yarn” begins. Many stories are narrated by these hosts, which help makes for the suspense and thrill of the story. One could be taken into a small American farmhouse where a family of boys from Hungary plan to start a new life away from the horrors they left back home. One night, to their horror, they find a man shredded to pieces in a cornfield. The boys only knew of one beast that could create such chaos and that was a werewolf. After more attacks and the death of their own father, the two brothers dedicate themselves to killing the beast. They split up to search the woods and one of the boys hears growling in the distance. He turns around to see the beast within shooting range and lodges a silver dollar into its throat with a slingshot. The boy approaches the beast only to watch in horror as the dead carcass transforms back into his younger brother. A late-night encounter with a vampire in a metropolitan alley way can really send shivers down one’s spine. Especially when they become the main character by the fiendish Vault Keeper. Trapped between two buildings with boarded windows and locked doors, the main character has nowhere to go but ahead into the darkness. When sheer horror is pulsing through a person’s body they fall to the ground helplessly, sobbing and begging for their life. This volume is not strictly horrifying tales, for Dark Horse Comics included every piece of the original comic book. 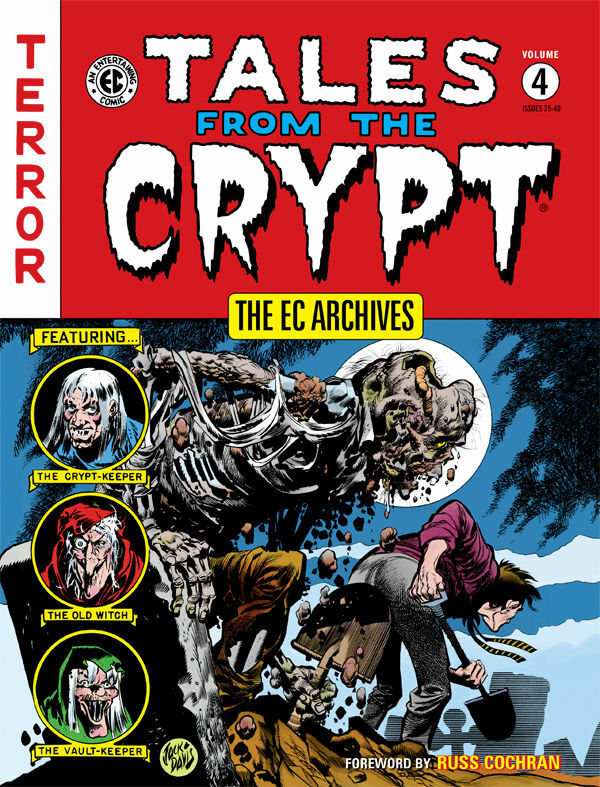 “The Crypt Keeper’s Corner” is essentially a spread dedicated to letters to the editor. Whether these letters are critics pointing out spelling errors or even fan mail, the Crypt Keeper always has witty replies, which can entertain after a terrifying read. All of the art done in the original comic was colored by artist Marie Severia and Dark Horse did a beautiful job digitally rendering it. If the brilliant story telling was not enough to send chills down one’s spine, then the dramatic artwork did. These aspects were what made “Tales from the Crypt” so entertaining. When the horror movies on TV are unbearable to watch this October, let the “host of horror narrate” a “nauseating novelette” from his collection and prepare to be properly terrorized.